Zanotti S.p.a. has been commissioned to make an important cool storage logistics warehouse for frozen foods with low energy consumption and high standards of safety. We are speaking of the new logistics center of the Napoletano Brothers, the one that will be implemented in Serino (AV). The structure is intended to store and distribute frozen foods, including all related picking operations. The warehouse has a capacity of 25,000 cubic meters and high density storage cells with automatic handling and a total capacity of 3,000 pallets. A cold storage access area and dispatch room with a temperature of 4/-15°C. The primary objective was to make a highly performing system with low energy consumption and the utmost safety standards. A two-stage system with a low environmental impact and a cascade cycle in R134A/CO2 was thus designed. The R134A fluid is used to cool the areas with a temperature of up to 0°C and for the second phase of the two-stage cycle. The CO2 fluid condenses at -8°C by exchanging heat with the R134A. 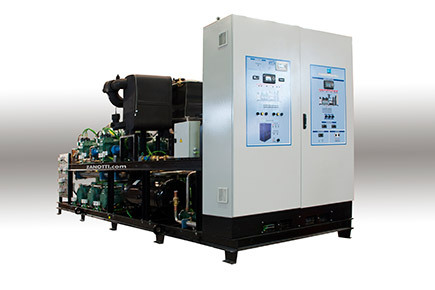 The system's cooling capacity is of 230 kW at -38°C, with a rather high COP value (3.80); and of 450 kW at -10°C, delivered by two screw compressors (R134A) and by three piston compressors (CO2). 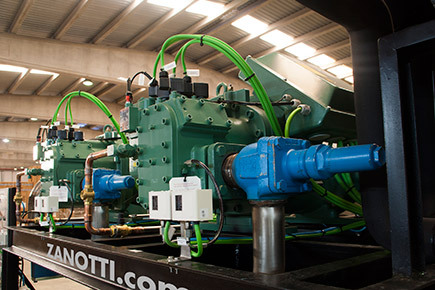 The cooling system is equipped with remote control functions and the BESTCOP yield management system that optimizes the efficiency of external conditions, allowing the system to work only under the most convenient conditions in terms of energy consumption and temperature. Special attention was paid to reducing the defrosting operations as much as possible in order to prevent moisture from getting into the cells through the filling openings or compensation valves. Forced dehumidification systems were used to prevent the formation of ice in the cells, thus greatly reducing the need to defrost them. The system is complete with a computerized installation that makes it possible to monitor the underground temperature to avoid icing. 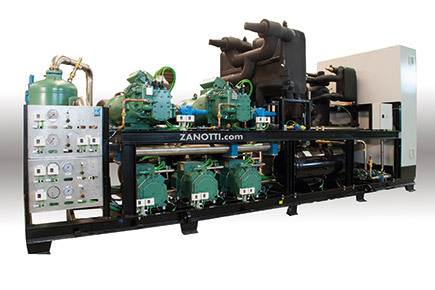 Low energy consumption "Zanotti" R134A-co2 cooling system.